The day I had fearfully anticipated for the last eight months had finally arrived. As we drove to the hospital that morning I was feeling unexpectedly calm. I'm not sure if it was the feeling that I needed to be strong for my family or maybe i was just numb. I knew this surgeon knew very well what he was doing and i felt comfortable with his 100% success rate and the statistics of the cardiac team. The operation would require patching two holes in her heart and splitting one abnormal valve into two. 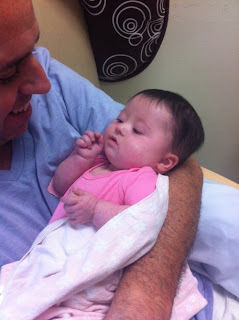 We knew pretty much every detail of the procedure and had become very comfortable with the doctors. I cried when it came time to give her away for fear of knowing it would be days before I could hold her again. Eight hours of waiting will definitely make you go crazy. Patti, our nurse, updated us every grueling hour. When the operation was complete is when I lost it. Immediately afterwards the surgeon came in and explained to us that the surgery had went well but when we were finally able to see her it was difficult to look. She had chest tubes, a breathing tube and iv's coming from everywhere and she was very puffy and pale. I couldn't hold back my outburst of emotion. It was beyond difficult to see her this way. 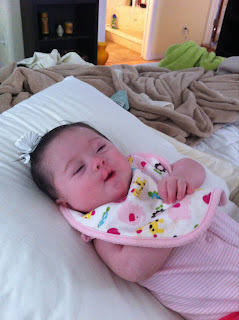 Just the day before she was giggling and rolling around on her playmat. Now she would lay restrained in a hospital bed for weeks being poked and prodded. To make things even harder I couldn't even sleep in the same building with her until her breathing tube was removed. Needless to say, I didn't sleep much at all. By the third day things weren't progressing and she was not recovering as expected. The area in and around the lungs was still saturated. We were told before the surgery that she would only need a breathing tube for one or two nights. After that I would be able to sleep in a cot next to her. It was now day five and they were still afraid she would not be able to breathe on her own, for her chest cavity was still congested with fluids. 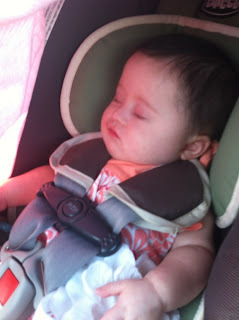 She had to remain sedated until they could take the tube from her mouth and she wasn't staying asleep very well. I would have given anything in this world to hold her at this point. I pleaded to god to make her better so we didn't have to endure this much longer. "Haven't I been through enough?" Apparently not because she was intubated for twelve days. 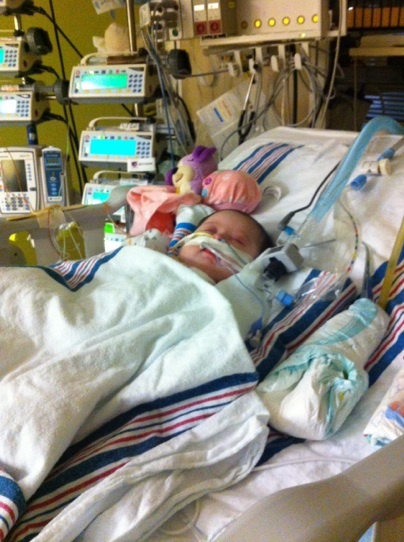 Her tiny organs fought through this recovery. Every day there was a little more progress made but not enough that we could relax. Violet, a stuffed dog that played lullabyes and environmental sounds, was the only thing keeping us calm at this point. As we obsessively watched her blood pressure, heart rate and oxygen levels rise and fall, ours were rising and falling as well. We tried taking daily walks around the medical campus to clear our minds but i can't say it helped too much. Every morning the doctors would do rounds in which they would go from room to room, patient to patient and discuss the current status and what decisions should be made for that day. I would pray so hard waiting for progress. It scared me more than anything to hear them talk. It took me back to my pregnancy when i would pray and pray and pray before i met with any doctor. I just wanted to hold my child and tell her everything would be ok. We had a choice to listen to them or not but either way it didn't matter. We still stressed. I wasn't sure what it was I should be learning from this experience. Maybe patience? Not to take anything for granted? I do know that I chose this path. I knew that having my child would not be easy. I also knew for the first time who the people in my life that actually cared were. Many of them through technology alone proved to be better people than those physically close to me. My faith in god was at a whole new level. Although I knew she would never remember any of this it didn't make it any better. I still wished I could have gone through this for her. I daydreamed of taking her home smiling and cooing and spoiling her rotten. I've had many broken hearts in the past but this didn't compare. The love you have for your child is like no other. I cried every day she was in that hospital. Even if the progress she had made was good i still couldn't help it. I felt helpless. At times I asked myself "why did i bring this child into this world to suffer?" I would quickly realize that I was the one suffering. She would be fine. As crazy as it sounds, during this whole process i thought a lot about giving Kalli a brother or sister. 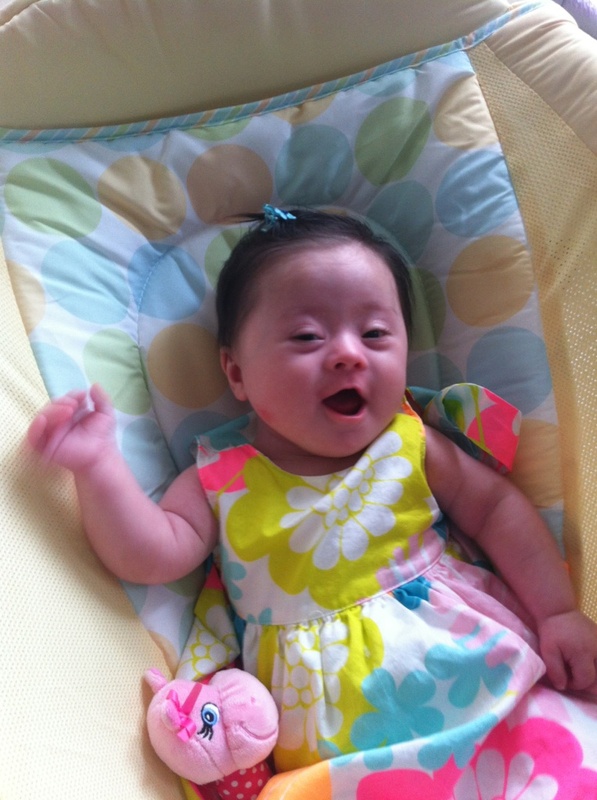 It is a proven fact that children with down syndrome greatly benefit from having a sibling. 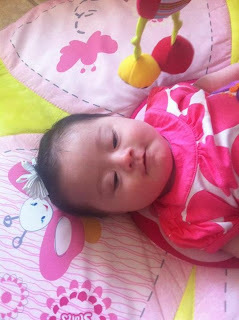 It is also a fact that once you have a child with down syndrome your chances of having another are greater. There is no way I could go through this again. Sobbing in public every time I saw a "normal" child playing or crying myself to sleep over the babies born on facebook perfectly healthy and in the comfort of their own homes within 48 hours. These things haunted me. What bothered me even more though was the thought of the 90% of women that had aborted their child with down syndrome. Or the women who aborted perfectly healthy babies for no good reason. I don't think that i am better than anyone because of the choice that i made to keep my child but i also believe that you should play the hand you are dealt. These women are throwing healthy babies in the garbage while i am fighting to keep mine alive. Each day in the hospital was full of ups and downs. One day her heart would beat at a perfect rhythm and the next it would skip beats. One day her chest xray would look better and the next day worse. I constantly reminded myself what a strong soul i was. Kalli would get through this and soon we would be at home celebrating. She just needed time. The day Kalli no longer needed the pacemaker was the day things started looking up. 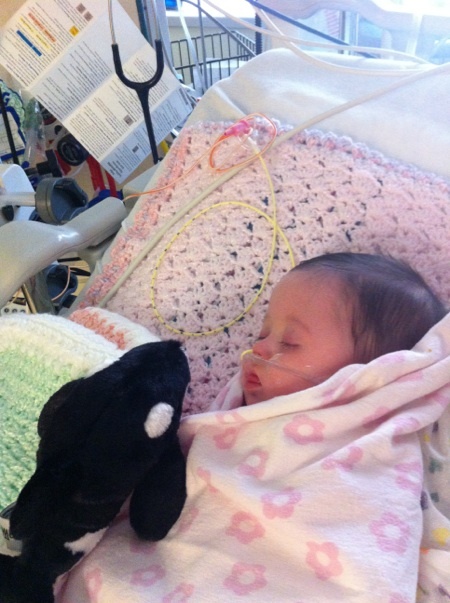 She was slowly weaned off of the breathing machine and several medications. From here on it was major progress. Once Kalli decided to get better, she got better. 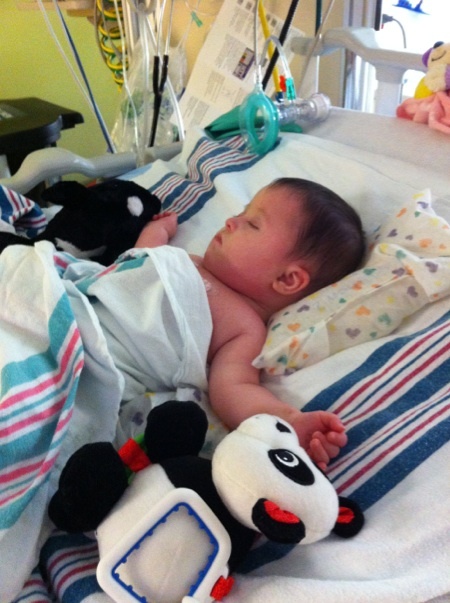 The doctors and nurses joked that she was an all or nothing kind of gal. Joking was good, REAL GOOD! 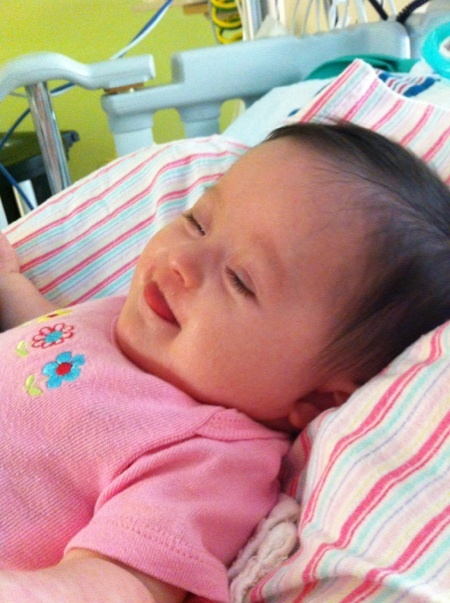 The first day she was able to eat without an ng tube she took a ludacris amount of formula. So much it made her sick! The good news was that she would have no trouble getting back to normal. Before we knew it, it was time to go home. I swear on the power of prayer! As much as i couldn't wait I was terrified. No more nurses or monitors. It was up to us to now. 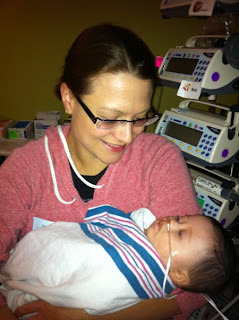 Kalli came home on April 12th after 17 days in the hospital. She was pretty stressed out and confused but we managed to make her comfortable. 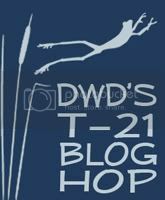 It would take her weeks to fully recover and as scary as it was, every day was progress. I can't thank god enough for allowing me to keep this child. She is the love of my life and continues to impress me every day. There is nothing in this world i could ask for now that she is well. I know that it will only get better. My angel *is an angel, no doubt in my mind. Every experience I have had with her has been life changing and i truly believe in destiny. I know she will continue to enrich my life and we will endure every obstacle with courage and strength. I Love you Kalli bug <3.